Welcome to my little place on the web dedicated to the Walton's TV show. I hope you enjoy your visit. I have had request many times for this quote from one of the shows. "I have walked the land in the footsteps of all my fathers. Back in time to were the first one trod, and stopped, saw sky, felt wind, bent to touch the mother earth and call this home. This mountain, this pine and hemlock, oak and poplar, laurel wild and rhododendron. Home and mountain, father, mother, grow to the sons and daughters who walk the old paths, to look back in pride and in honored heritage. To hear it's laughter and it's songs to grow to stand and be themselves one day remembered. I have walked the land, of footsteps of all my fathers. I saw yesterday and now look to tomorrow." On the side of this page is a link to a Trivia page. Try your luck!!! I have added some photos and information about two other shows I have always considered to be among the best of classic TV. You can find the links on the left side of the page. ENJOY! You may want to visit The Walton's Mountain Community Center. 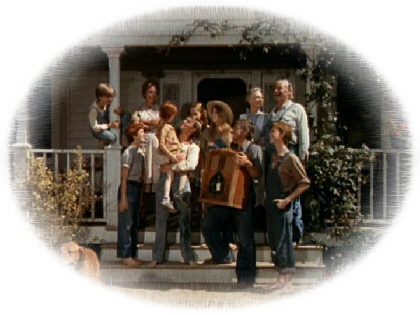 This site has a Complete Waltons Synopses: Expanded synopses from the television episodes written by William Atkins and Arthur Dungate. My thoughts on the Waltons. The show has meant so much to me over the years. In this world of changed values it's nice to find a place were you can go to find the values you so dearly love and cherish. Even though it's a TV show it's an oasis to get lost in where the world can't touch you, for a least an hour. Let's face it, the world has changed and I think that it should have kept more of those old time values in place. I know there are some out there who still hold to those ideals of honesty, charity, hard work and the most important Love of family. I hope you enjoy your visit here and come back often when you need to find that oasis!